Baking blogs are usually happy places full of gorgeous pictures of mouth-watering pies, cookies, cakes, flan, and anything else you can imagine. Well, not today folks. Except for the mouth-watering goodness, I do have a picture of that. Today is a sad day for the food world. 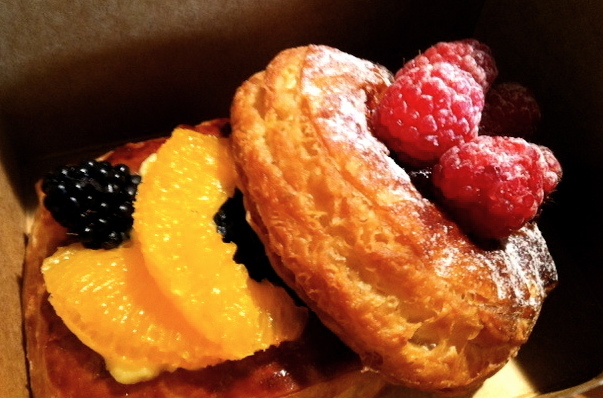 We recently lost one of the best kept secrets in French pastry deliciousness: Bijan Pâtisserie. Nestled on a side street in downtown LaCrosse, WI…yes, Wisconsin of all places…was the most amazing pastry shop I have ever been to. High praise, I know, but I have been to France, and sampled their mountains of pastry (all lovely!) and never found anything that tasted quite like the pastries from Bijan’s. The shop also serves sandwiches, gelato and freshly baked breads, makes a mean cup of joe, or so I’m told, and plays music you would hear in a french bistro (with the exception of one morning’s Ke$ha track…but you know I would never fault a man for that. )To top it all off Mr. Bijan himself is an adorablely authentic frenchman with the most charming accent. While the pastry cream and raspberry varieties were my favorite, I never turned my nose up at his pain au chocolat, croissants, monkey bread, caramel rolls, ham and cheese croissants, or really anything else I saw in the display case. Seriously, these pastries got me out of bed before noon (barely) on a Sunday. So why am I posting about these morsels of deliciousness if you can’t get your hands on them? You’re right, it is unfair….unless we convinced Bijan to move to the cities! That’s right, I am officially starting a campaign to bring Bijan Pâtisserie to the Twin Cities! Crazy? Perhaps, but so is my love of buttery, flaky goodness enveloping delicious goo. Trust me, Mr. Bijan, we are far more appreciative of your culinary genius than the 6am beer drinkers of LaCrosse. *Disclaimer: I do not speak French. This entry was posted in Uncategorized by theculinarycapers. Bookmark the permalink.